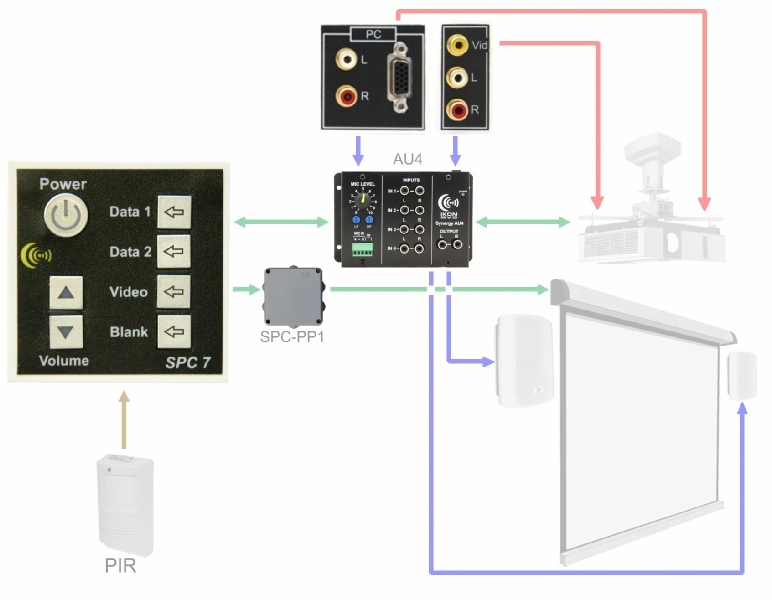 Projector, LCD & Plasma display control. Dual outputs for screen control. Input for PIR, keyswitch or remote power-down. Pre-configured & downloadable device drivers. 3 input select buttons, video button can be programmed to select between two video sources. Volume up/down buttons, can be programmed to operate screen raise/lower when display is off. The iKON AVS SPC 7 is a cost effective, entry-level control interfaces for display devices, including LCD and DLP Projectors as well as LCD and Plasma displays. The SPC 7 controllers feature an orange backlit power button with three green backlit input select buttons, a blue backlit picture blank button and two buttons for volume raise and lower. The video select button can be programmed to toggle the display between two video inputs. The controllers feature a bi-directional RS-232 interface for control of the display and two open collector outputs for the control of an electric screen via a SPC-PP1 or external relays. An input is provided for room occupancy detection, panel lockout or remote system shutdown. The installer can also set up a four-button sequence to lock and unlock the panel operation. To program the unit it is only necessary to download a library module for complete control over the display, although full control over input selection, warm up and cool down times is provided. The SPC 7 is fabricated on a 50 mm Euro module allowing it in a wide range of wall panels in UK, European and NZ formats. This format also allows the easy combining of control and input panels as well as use in the iKON range of desk modules. Supplied complete with a UK white mounting frame. output can be either low or high (on or off) for motion detected. 10 way 3.5mm pitch detachable screw terminals. 12V DC @ 30mA + external relay current. 12V, 300mA power supply included. 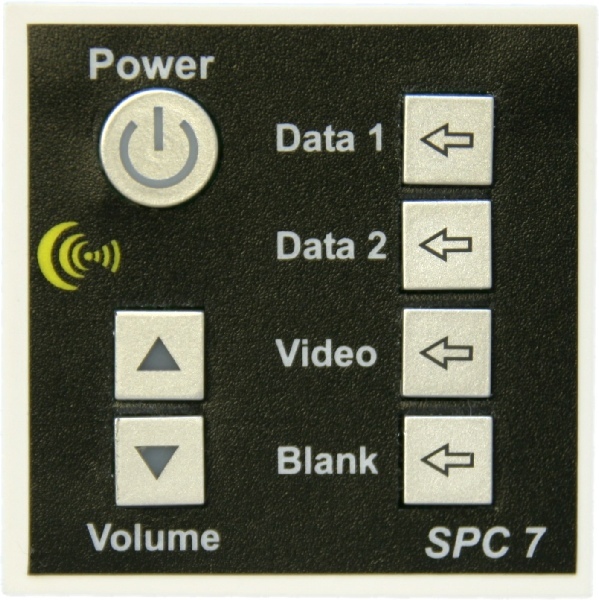 The SPC-7 is a simple RS232 projector controller. The SPC-7 will be programmed to your requirements at no additional cost. Supplied with white frame, surface back box and UK power supply. Price includes VAT , delivery and programming.